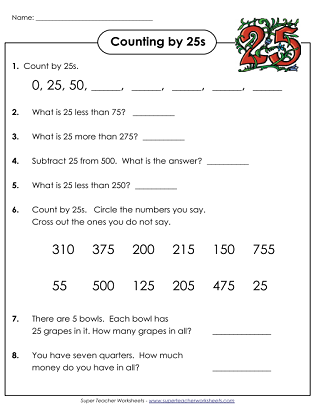 Use these worksheets to teach kids to count by 25s. Twenty-five, fifty, seventy-five, one hundred, one hundred twenty-five, and so on. When you know how to count by 25s, counting money is a piece of cake. Count the t-shirts, baseballs, and gum sticks in groups of twenty-five. The waddle of penguins are all lined up on the ice flow to count by twenty-fives. Some are missing! Students write the correct numbers on the penguins. Twenty-five, fifty, seventy-five, one hundred! 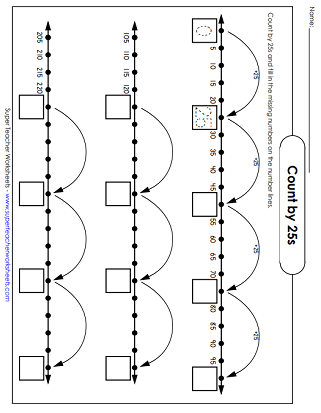 Review counting by 25s with this worksheet. This worksheet features illustrations of bikers. Skip count by 25s to fill in the missing sections on the caterpillar. Count the quarters and write the correct amount of money. This basic level worksheet goes up to a dollar. Here's a more advanced worksheet for counting quarters. Students must be able to count up to $3.25. 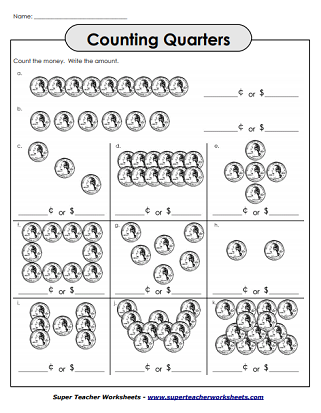 Here's another worksheet for counting quarters. These seven questions will review 'counting by 25s'. Write numbers on the balloons - and try not to pop them! Count by twenty-fives all the way up to six hundred.